We’ve all heard the saying; “If it was easy, they’d all be here”! A simple seven word statement that perfectly sums up the fitness industry! Every day we look for motivation to improve our health; to get to the gym, to get stronger, to be leaner, to lose the weight. A never-ending struggle to reach our goal/s…and so it should be. In my opinion, it should be a struggle. When we work hard to achieve a goal, our achievements are more meaningful and long lasting. Reach a goal! Celebrate! Set a new one! So, let’s celebrate! This week we celebrate Towne Fitness member, Melanie Lethbridge. A long-time member of the gym, a mother, a wife, a motivator and an achiever! 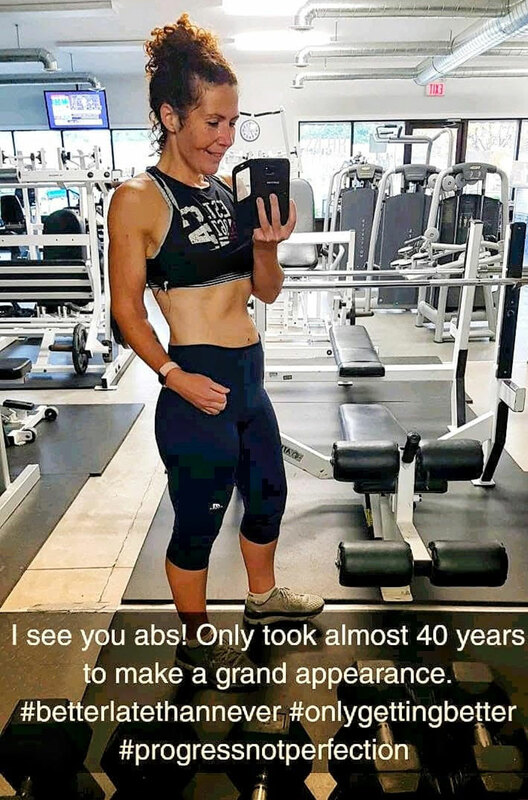 A woman on a mission who just recently celebrated her 40th Birthday. [I’m sure she doesn’t mind me sharing that with you]. Another reason to celebrate. Mel began her ‘journey’ several years ago! At first, it was a weight loss journey however over time it became much more than that. You can throw every excuse in the bag and Mel has more than likely had to deal with it; self image, genetics, shift work, children and all their activities, career change and general motivation. At her heaviest, [not pregnant] she was 250lbs. After that she stopped weighing herself. Mel is the first to admit she has made mistakes along the way and advocates that one plan does not fit all. She openly and honestly shares her journey and experiences with fellow gym members and has presented to our 12 Week Results Challenge Group. 2018 has been a big year for Mel. In August she completed her first Try-A-Tri, in true Mel form, with a big smile on her face and last week was awarded a certificate of merit from Concept2 for completing five million [5,000,000] meters on the Rowing Machine! 5 Million Meters! That’s 5,000kms! Is she finished? No. New goals have been set. Let’s see what 2019 brings this athlete. Mel is a true advocate for healthy living. She now works in the health care industry and sees first hand what can happen when a healthy lifestyle is not a priority. No matter how tired she is, Mel shows up. Whether it is ‘pre’ or ‘post’ 12-hour shift, she walks in the front door like a boss, with a huge smile and a ‘Let’s get it done’ attitude! Now that’s something to celebrate!